Many children in rural areas like Binh Chau leave to go to Saigon for work as soon as they graduate high school (if not sooner). We know the time we have with these kids at Children’s Church is limited so we have always stressed the importance of reading and memorizing God’s Word. 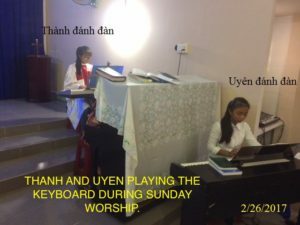 Our prayer is to give them a solid foundation of God’s Word so they will seek out a church in Saigon to continue to grow in their walk with the Lord. 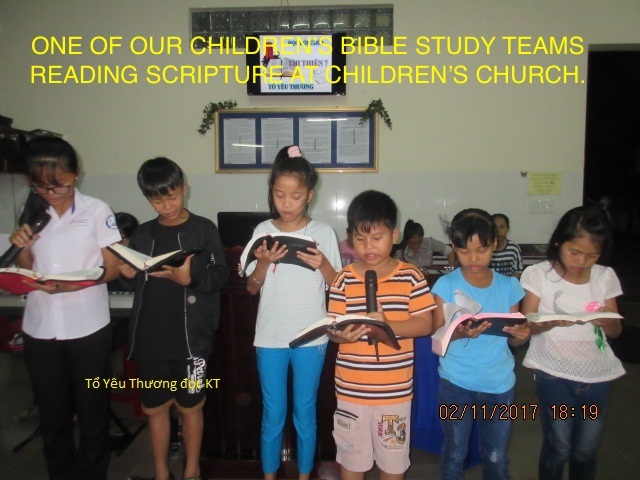 We praise God as 9 of our last 12 kids to leave Binh Chau have found a church to attend. We are always trying new things to motivate the children and make it fun to study God’s Word. We now have Bible teams (one in picture above) who read, study, memorize God’s Word together and compete against the other Bible teams. 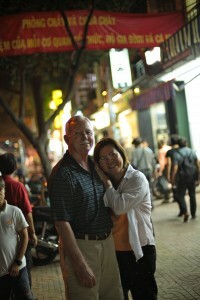 One of the incentives is to take them to the KFC in Ba Ria (about 45 miles away). 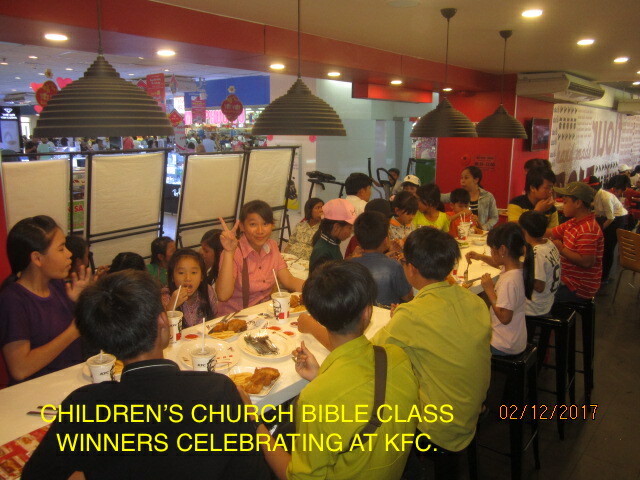 The picture below shows some of the 20 kids who excelled last year enjoying their KFC meal. We also give our high school and older middle school kids the opportunity to read God’s Word during every Sunday Worship. Diep attended one of our Christmas Evangelistic Outreaches last year, accepted Jesus, and has been attending church since then. After hearing what God teaches about idols, Diep decided to remove all the idols in her house. The picture above shows her and Kim taking some of them down. Then Diep asked to be baptized, which Pastor Nhan did at Sunday Worship. Cam On Chua (Thank you Lord)! Mai is doing a great job in teaching the kids to play the piano and keyboard. And, the kids are catching on quickly. After just 4 months some of them are already playing during Sunday Worship (picture above). Mai has about 11-12 students now. The kids are excited about learning and being able to use their talent to serve the Lord. Mai is also making great strides in working with our children and adult choirs. After a teaching of why we should be baptized, we had 3 children (Dang, Phong, and Anh) who wanted to be baptized. Pastor Nhan baptized them in the South China Sea. Hoa Bien (whose father died last year, and in her grief, she tried to commit suicide) recently was run off the road by another motorcycle. She suffered a deep gash in her chin that required several stitches. The church paid her medical expenses through our mercy ministry. The date for this year’s Vacation Bible School Camp will be June 5-7. We will be celebrating our 10th anniversary of VBS at the Binh Chau Church. We remember the very first year when God blessed us with 40 children who attended. God has given us so much joy seeing Him add more and more kids attending each year. We praise our Lord for the 125-130 average children in attendance over the last 5 years. The Binh Chau Church leadership, assisted by some of our high school youth, will put on the VBS again this year. Last year was the first time we didn’t bring teachers from Saigon, and our youth we trained to help teach at VBS, did an excellent job. Members of our Jesus in Vietnam Focus Team will have tables at CFC on Sunday, March 26, April 2, and April 9, seeking sponsors for our VBS camp this summer at the Binh Chau Church. The cost to send a child to our VBS camp is $50, as they stay at the church 3 days and 3 nights hearing God’s Word taught, learning Bible verses, hearing the Gospel, playing games/activities, enjoying 4 hot meals a day (plus snacks and prizes). In addition, you will also have the opportunity and blessing to provide a bike (cost $75) to be given a child at VBS for Scripture memorization. We are so thankful and humbled by your prayers and support, which enables us to share the love of Jesus with His precious children in Vietnam. Please pray God will use this year’s VBS to bring many non-believing children to faith in Jesus and give them a desire to attend Children’s Church so they might grow in their walk with the Lord. Please pray for strength for our brothers and sisters in Christ to stand firm in their faith in spite of the daily persecution from family, friends, and neighbors they receive. Please pray for our youth as they learn EE that God will give them a desire and many Divine appointments to share the Gospel with their friends or other kids. Please pray God will use our Bible training programs to instill a solid foundation of His Word in our youth’s hearts so they will continue to serve Him as they grow into adults. Please pray God will open the door for us to be able to build the mercy ministry apartments to help needy families in Binh Chau.